I found these photos of the French pointe shoe brand Continsouza completely by accident during one of my internet researching episodes. This is getting to be a regular occurrence for me. I set off to hunt for information about one mystery pointe shoe brand and end up finding another! I was able to dig up a small bit of history on the Continsouza name. A well-known French manufacturer by the name of Pierre-Victor Continsouza invented and produced specialized camera’s and equipment for photography. The business became very successful and grew into a very large production company in Paris. 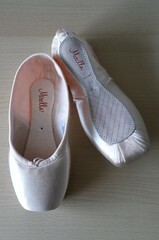 As you can see, Continsouza also makes (or made) ballet slippers. 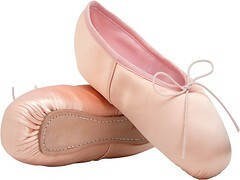 I found the ballet slippers for sale on a French merchant website. At this time, I can’t know whether this brand is discontinued or not, so it will be added to the mystery list for now. 9/2014 UPDATE: After all this time I am still no closer to finding out where French dancers are sourcing these shoes. They continue to appear for sale online sale since this post was originally published. 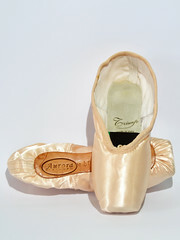 This entry was posted in Mystery Pointe Shoe Brands and tagged Continsouza pointe shoes, French pointe shoes. Bookmark the permalink. 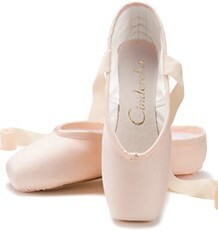 Actually i’m French, i am 29 now and i used Continsouza pointe shoes from the age of 9 to the age of 14. They were absolutely great. They were strong and difficult to break but they had the perfect form for Greek feet. And they were beautiful……Unfortunately they do not make them anymore and it’s impossible to find them now…… I try a lot of pointe shoes. For the moment i have a pair of Carlotta from Repetto and i’m trying Freed but i regret Continsouza ……..
Hi! My name is Patricia Storelli and I am the author of “The Magic of Pointe Shoes”. When I was training in France I discovered by chance the Contin-Souza pointe shoes: they were awesome and the best pointe shoes I have ever worn in my entire life. I would call them the “magic slippers”. Unfortunately I confirm that the factory does not exist anymore and there are no more Contin-Souza shoes exist on the market. I wish I had kept one to be able to reproduce the same type of shoes, but unfortunately I didnt…. 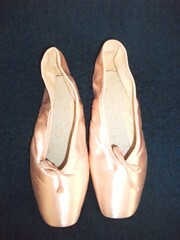 I love to hear stories about beloved models of pointe shoes. This particular brand will probably be museum-worthy at some time, just like the shoes made specifically for the Bolshoi Theatre back in the 1980’s. What I find baffling (yet very interesting!) is the absence of company history and/or business closing information. I adore the title of your book, “The Magic Of Pointe Shoes”. That sums it up perfectly! 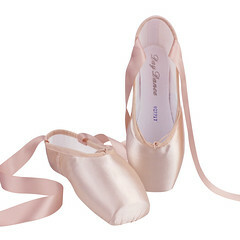 There is no other shoe on the planet quite as magical as a pointe shoe. This is a wonderful example of how brilliant the internet is for finding and exchanging information of mutual interest. How amazing it is to discover this information about pointe shoes – I would have loved this level of information when I was younger. i have a pair of Contin-Souza pointe shoes that i bought in Paris in the late 1990’s from a shoe repair shop off of Boulevard Montparnasse. The owner told me that he made them for his daughter, who had trained at the Paris Opera Ballet. Perhaps it was a very small company…….he told me then that the company no longer existed. i assume that he copied the shoes for his daughter. I love finding unknown shoes so I bought the only pair that he had. I was wearing Stanlova at the time— still love them……I live in NY…..buy them n Paris. Hi…Max Continsouza was the grandson of Pierre Victor Continsouza… He was my brother in law (from my husband family) he was a ballet dancer and when he broke his leg could not dance anymore so he open the factory of ballet shoes…his wife Emma Continsouza was my husband sister married to Max…he sold the factory in Paris and retired in Spain .. died 10 years ago… I hope this will help you with your research…. Thank you, Marta, for sharing this information with us. Hi… I was searching for retainer and very disappointed. 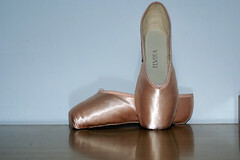 I have 3 pairs of Contin Souza left (15 / 3) from my former dancer carrier. I used to order them in Paris and ordered always more than I needed. So, who wants? (I would sell them all 3 for 60 Euro. They are absolutely new. I can sent some photos. I ‘m really sad, that the production has stopped. It was a kind of secret good tip. Really great shoe !! !